Yes I know August is past but I wanted to share this page I made LOL! 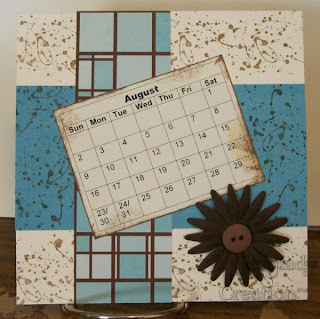 On my Yahoo group I took 2 months in our upcoming calendar swap and this is my August page :) I saw this funky paper (strip in the middle) in my big pack from Joann's that I got eons ago and it went from there. Well the chocolate color was hard to match so I used my ink pads and TAC splatter stamps to go around the white and blue DCWV paper and then I used my Copic Marker to color the flowers adding a button in each center too! The end result is fun and I hope everyone enjoys it! great page, like all the splatters.